Ever gone camping? Or travelling through Asia? For thousands of years we all squatted to go to the loo. It’s how our bodies were designed to release. Even today almost two thirds of us still squat, and research tells us that these are the people who generally enjoy great gut health. Yet here in the western world, where we have been using the seated loo for only 200 years, we have alarmingly high incidences of constipation, haemorrhoids, Irritable Bowel Syndrome (IBS) and bowel cancer. These gut ailments are almost unheard of in the parts of the world where people still squat. The thing is, that in the modern western world, squatting isn’t exactly the most practical thing you can do. We’re not about to install squat toilets in our homes, so using a PROPPR is the next best thing. 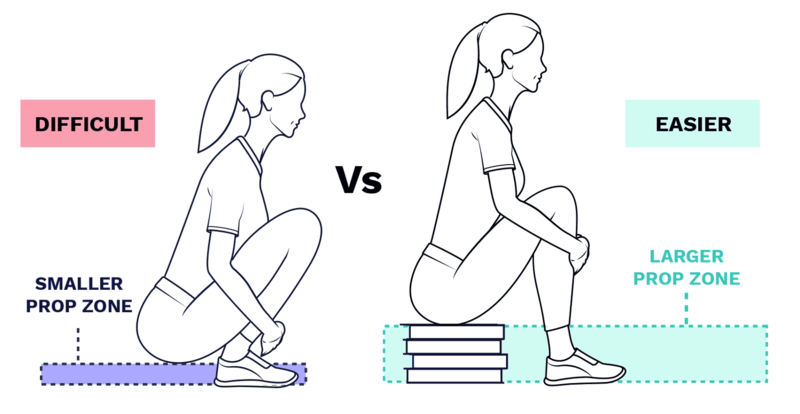 It helps simulate the squat position whilst using your normal loo – you squat and sit at the same time! The science is simple. The hip flexion achieved by squatting (PROPPing), releases the muscle holding a kink in your colon, your colon straightens and waste passes with ease. We love habits. Good ones. Call them rituals if you will – but the idea is that eventually your PROPPR will become almost invisible to you. You will get so used to using it, it will integrate into your daily life in such an easy fashion that you will neurologically wrap yourself around this daily habit and it will become a seamless part of your day. Our hips and knees aren’t really built for the maximum squat position, but if you get about half way there, you still get the maximum effect. The PROPPR is designed to simulate the easier squat position. It doesn’t matter how tall or short you are, the PROPPR is simply designed to get you about 20cm of the ground. We call this magic height the “PROP ZONE”. Our PROPPRs are designed to get you into this magic zone. To use the PROPPR, put it in front of your toilet and put your feet on it. It will get you into the magic PROP Zone. It doesn’t matter how tall or short you are – the PROPPR is effective for everyone 140cm-200cm tall. Can you sit 20cm off the ground? Then you're ready to PROP. The only fit test you need to do, is see if you can sit about 20cm off the ground. It might be a bit uncomfortable at first – that would be your knees and hips waking up from a long slumber. But if you can sit in that position for about 20 seconds, you’re ready to start PROPPING! If you really want to get the tape measure out, just check your loo is 42-45cm tall. The Average Australian Toilet Height (including the seat) is about 42-45cm tall. We’ve designed the PROPPR with this toilet height in mind, so the gap between the top of the lid and the top of the PROPPR is roughly 20cm.